A thin strip of dusty road cuts its way through the coconut palms between the warm waters of the Arabian Sea and the magical Keralan backwaters. This road is busy with water trucks, fishermen, bike riding villagers shouting their wares, three wheeled yellow and black autos, farmers leading their tethered cows to fresher fields, taxi drivers and children carrying pots to fill with water from the stand pipes that line the road. India is filled with people who independently find a way to make a living: India is filled with entrepreneurs. You could say they have little to lose .. the fishermen who invest in their nets, and the more fortunate in their motorised boats, have to fish to live. If they don’t catch fish they don’t eat. But they have no mortgage to pay, no water bills, no huge heating bills .. they own the shack in which they live with their wife, their parents and their children, and that is usually all that they have. No designer clothes for them or latest technical gadgets.. our lives by comparison in the Western world is filled with unnecessary commodities. It is tempting for Western tourists to think of these people as poor. They are not. They are rich in their ability to survive and to survive independently of any social support or welfare state. They are flexible. They are used to living with intermittent power supplies, irregular water services, and no mainline phones. If the world’s technical systems were to fail tomorrow as they well might – they might not even notice. If the World Wide Web ceases to exist nothing in their immediate lives would change. When I left the Corporate world to become independent one of my independent colleagues remarked to me in a meaningful tone “when you go independent Sue you become independent” I eventually came to know what he meant but my independence is like a tiny spark in comparison the lives of these Indian people. And some of the states in India such as Kerala are seeking to extend this way of being to more of the population – the women in particular. Despite being a state that bans the public consumption of alcohol there is a huge problem of alcoholism with many of the men in Kerala and increasingly it is the women who bear the brunt of this. So the women are beginning to take their lives into their own hands. Every Friday morning that strip of dusty road (and many others in this state) is filled with women dressed in brilliant cotton sarees carrying plastic bags filled with all sorts of things that will help them to make their case. One of the local bankers is backing a scheme to provide money for new enterprise. These women collect at patch of sand behind the beach wall and in a circle they make their cases for their business ideas and a sponsorship. And there are conditions. The money that they borrow must be paid back in 6 months time so the women in the circle have to decide who they trust to make this investment pay and who they trust to be able to return the loan so that others may benefit in the same way. They sit there for several hours discussing sometimes quietly sometimes heatedly but always with the community in mind. And arriving and leaving they are always generous in their greetings and their smiles. What to call the business, when to start, where to work – none of these are important. What matters is trust and passion and dedication to work and success.. and evidence shows that they are succeeding. This entrepreneurial spirit is becoming the essence not only of every family but of every person in the state…. If you were invited to join that circle of colourful Indian ladies, do you think you would demonstrate the entrepreneurial promise that would get a resounding Yes? 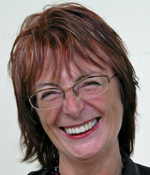 Sue Knight is author of NLP at Work (new 3rd edition) and is an international consultant, trainer, coach and speaker. You can reach Sue through her website www.sueknight.co.uk where she also publishes details of her programmes in India as well as other parts of the world. Sue Knight has been at the heart of the coaching and mentoring capability of many of The Academy for Chief Executive’s leaders throughout the organisation’s history and, as a speaker on using NLP in the workplace, has influenced and inspired many of the members, too. To find out more about membership of our organisation, visit www.chiefexecutive.com. Posted in: Business, business support services, CEOs, coaching, Communication, Entrepreneurship, Expert Speaker, Leadership, leadership mentoring, MDs, NLP, peer group support.